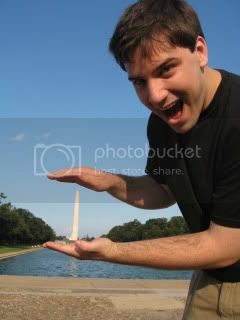 Being in DC this week reminded me that I've never posted about the little road trip Roger and I took there in 2009. I can honestly say that I don't remember what we did on Day 3, but that I do distinctly remember searching endlessly for good food after I wrote this, and that we ended up going back to the hotel exhausted, and ordering Dominos online. It was actually a pretty fantastic meal. Roger and I are having a lovely time in Washington. We came so that Roger could do a little research for his honors thesis, at the Museum of African Art, and to do a little sightseeing. Other than a quick overnight visit with my friend Vrinda last March, I haven't been here since I was 12, and Roger's never been, so we're enjoying our time exploring. Yesterday, our Megabus was a little late (when isn't it? ), and we arrived in DC at 2:30pm or so, and headed to our hotel, Rouge, which is hypertrendy, and a little trashy. The trendy part: everything is bright red and they have free hangover brunch of bloody marys and cold pizza every weekend morning. The trashy part: there's a huge mirror overlooking the bed and everything is bright red. Still, it's close enough to everything (about a mile away from the White House and monuments), and was pretty cheap. We grabbed a late lunch at Old Ebbitt Grill. The restaurant is from 1856 (the oldest bar in DC) and has gorgeous green velvet booths and gas lamps. It's pretty touristy, so even though it looks fancy (and there was a wedding going on when we came), they're fine with coming in in shorts and the prices are nothing more than you'd find anywhere else. 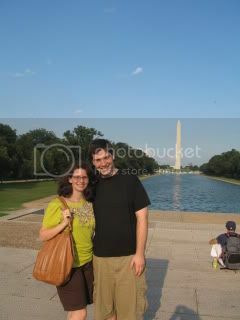 After, we walked around the monuments, and Roger catered to my desire to have a picture of us in front of the Monument. That night, we went to a Thai restaurant with Vrinda, followed by walking around DuPont Circle area and visiting Kramerbooks and Afterwords Cafe, which had fantastic books, including Handmade Home, and a very cool ampersand decor. We finished up the night by getting fantastic ice cream at Larry's, which was really good (almost as good as Blue Marble, and with more flavors), but had a bizarre mural based on "Guernica" with ice cream. Today, we had bloody marys and cold pizza, and headed out to the National Museum of African Art, by way of HSBC (we'd found a stray credit card on the street yesterday, and returned it there this morning). Roger had been planning to do part of his thesis on the permanent collection there, but after we arrived, it turned out that just about none of the permanent collection is on display, which was pretty upsetting. They had a really lovely ceramic water bottle, but not too much else. I liked a lot of the art in the exhibits, but there were some really big problems with their presentation. We then wandered around in the heat, before deciding to get lunch at the National Museum of the American Indian, which was pretty good, and divided up by region. After that, we headed over to the National Museum of American History, where we saw the First Ladies' gowns, Julia Childs's kitchen, and some presidential memorabilia. Completely exhausted after seven hours of walking and visiting museums, we headed back to the hotel, and are now enjoying the air conditioning, because it's hot outside! Roger wants me to note that we're having a debate about whether we should go out or get pizza with garlic butter dipping sauce delivered to the hotel. We're really not, though. We're definitely going out in a little while. Overall, though, we like DC. The city is spread out, so it's been a lot of walking, but the city is very lovely with all its white marble, and the museums are mostly free, which is fantastic. We're still not sure what we'll do this evening or tomorrow, so we're open for suggestions.